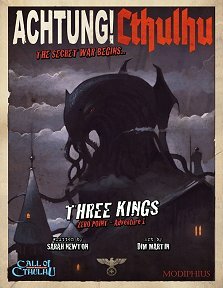 Publisher's blurb: "Three Kings is the first in a series of standalone adventure supplements in the globe-spanning Zero Point campaign for Achtung! Cthulhu. Join a band of heroic soldiers, agents, and partisans behind enemy lines on the eve of World War Two, as they discover the unspeakable horrors of Castle Karlstein in occupied Czechoslovakia!"